Egg whites to treat moderate burns? Do the intertubes really know better? An odd thing happened on Facebook the other day. S--, a former colleague, posted the unhappy news that she had "just burned the F*CK out of my left index finger" while making dinner. A bunch of her Facebook friends chimed in immediately with sympathy and suggestions, led by her mom ... who offered the sensible advice that she cool the injury immediately in ice water. I didn't see the post until nearly an hour later, but thought I'd suggest -- for next time -- a folk remedy my family learned from another when I was a wee lad: after a minor to moderate burn, crack an egg over the injured area to coat it in raw egg white (it's a better idea to cool the injury under cool running water, then crack the egg). Apparently this was novel advice to S-- and those of her friends who were weighing in on the What Is To Be Done question raised by her not-uncommon kitchen mishap. She was certain that the burn was severe enough to blister, and it was still hurting an hour later, so -- better late than never -- she tried the egg treatment, and found that the pain went away. S-- wrote that she was "happily flabbergasted." I was flabbergasted too. Not because the egg trick had worked, I was pretty certain it would -- but because the treatment seemed to be unknown to S-- and her circle. So I turned to the hive mind to find out whether Everybody Knew that raw egg white helps to treat moderate burns, or if I had been living in an alternate universe since the 1970s. It seems that everybody knew I'd been living in an alternate universe. Akin to another Internet-spread rumor regarding the treatment of burns (which involved placing the injured extremity into a bag of flour), this seemingly helpful heads up also began making the online rounds in March 2011. In a nutshell, don't do it, because the danger of introducing salmonella into an open wound should not be toyed with. 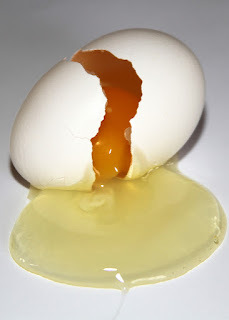 As to what to do with all this confusion, even when the burn is minor and the injury is fully cooled before anything else is done to it, there is a downside to coating such an injury with egg white. Raw eggs sometimes contain or have resident on their shells salmonella, a deadly bacteria. Introducing salmonella into an open wound would be a dangerous idea. Says a physician friend of ours, "Burn-injured, denuded skin is an excellent culture medium, and a contaminated egg white applied to his burn could readily cause severe damage or death to the patient." Oh, c'mon, I thought. Really? Salmonella? Motor oil? This descriptive study was conducted among 130 families in Milas, Turkey, who have children ages 0 to 14 years. Among the 130 families, a total of 53 children (40.8%) experienced a burn event. Twenty-seven subjects (51%) had treated the burn with inappropriate remedies including yogurt, toothpaste, tomato paste, ice, raw egg whites, or sliced potato. Of the 28 subjects (52.8%) who had applied cold water to the burn site, 21 patients (39.6%) applied only cold water and 7 patients (13.2%) used another substance along with cold water. In addition, 13 subjects (24.5%) applied ice directly on the skin at the time of the burn. Excluding the subjects who had treated their burns with only cold water or with only ice, raw egg whites were the most commonly used agent, both alone (n = 3) or accompanied by cold water or ice (n = 6) in a total of 11 subjects (21%) who applied eggs. Based on these observations, it is suggested that educational programs emphasizing first-aid application of only cold water to burn injuries would be helpful in reducing morbidity and mortality rates. A nationwide educational program is needed to ensure that young burn victims receive appropriate first aid and to reduce the use of inappropriate home remedies and burn morbidity. Burn morbidity. That sounds pretty grim. I learned about burns and egg whites on a family car-camping trip in the mid-seventies. It was a multi-family camping trip, including mine and that of a postdoc in the Stanford University lab where my father was earning a degree in medical microbiology. The postdoc -- now a decades-long family friend -- was from Japan, and he was already, by the time he came to Stanford, a medical doctor (and therefore, going back to the Snopes screed, a physician friend of ours). He went on to become a professor and internationally respected research scientist before retiring a few years ago. But it was his wife, E--, who taught us about burns and egg whites. At the time of this camping trip my brother was eight or so years old, plus or minus, and while our families were preparing a meal he burned his hand on a hot pan, cast iron if memory serves. Shocked, hollering bloody murder, in the middle of nowhere and hours from the Stanford Medical Center, E-- lunged for the ice chest, found a raw egg, and -- you guessed it -- cracked it over my brother's throbbing hand, slathering his injury in albumen. It worked. The pain subsided, my brother calmed down, then my parents calmed down, and eventually we ate. I remembered this trick when I was working in a restaurant some fifteen years later. I don't recall what I was making, but it involved a 10" All-Clad skillet and a very hot oven. Short story, I was doing five or six things at once -- S.O.P. for an on-duty cook -- and managed to forget to wrap a towel around the skillet's handle when I grabbed it and pulled the pan from the oven. Hot? Let me tell you ... the whole palm of my hand and the inside of all my fingers went instantly bright, angry red, and I hurt like I'd never imagined. It was a kitchen, probably not fundamentally different from yours at home, so a sink, ice, and a big metal bowl were mere steps away. I ran water over my right hand before plunging it in ice water, then did my best to get on with pumping out my station's dishes, one-handed. After a few minutes, in a moment between plating antipasti, I cracked a couple of eggs over still throbbing hand, wrapped it in a clean towel, and finished my shift. Miraculously, the burn didn't blister and the pain had subsided altogether by the time the kitchen closed. I was back behind the stove the next night. I posted a letter to Japan shortly afterward, thanking E-- for saving me from a second degree burn over a distance of 5,000 miles and a fair few years. So what's a person to do when folk wisdom -- verified by repeated, first-person, empirical experience -- contradicts medical authority? I'm not going to try to give a general answer to that question. But in the case of egg whites and kitchen burns? I'm thinking that if "only one in every 10,000 to 30,000 supermarket eggs is typically infected with salmonella enteritidis" (without clear evidence that free range organic chickens lay fewer infected eggs, so don't get cocky, as it were, if your fridge is stocked with the good stuff) -- even so, it's got to be way safer than crossing the street to go with the egg white treatment, unless a burn injury involves broken skin. But caveat lector: I'm not a doctor, and I don't even play one on the intertubes. Thanks to Samuel M. Livingston for the photo of a cracked egg, via Flickr. It's hard to keep one's head from spinning right off one's neck trying to follow 'arguments' by which the surveillance state scrabbles to paint its interest in snooping as legitimate. Obama administration officials have pushed the [technology] companies to find ways to let law enforcement bypass encryption to investigate illegal activities including terrorism threats, but not weaken it in a way that would let criminals and computer hackers penetrate the security wall. Hmmm.... Will Mr. Earnest next deploy that argument against the developers, manufacturers, and distributors of ... wait for it ... handguns? What about pesticides, chain saws, high fructose corn syrup, automobiles, and alcohol? What about military weapons, from bayonets to nukes? White House rhetorical fluff masquerading as argument fills the sails of libertarian me-firsters and paranoid Texas governors who cast sinister aspersions on the hostile intentions of the PotUS until they needs help bailing out the state after fierce rainstorms that have nothing to do with climate change, which just happens. Obama administration officials are wrong to push for a technically and politically impossible 'good guys only' back door to the encryption technology that protects any and all online communication and commerce. They should quit trying to justify their demand with dumb-as-rocks arguments. 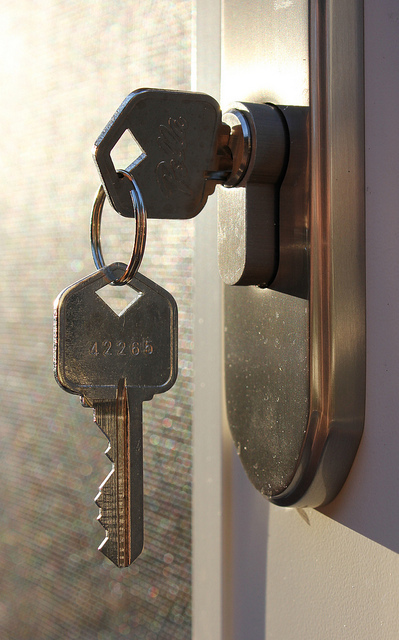 Thanks to WoodleyWonderWorks for the image of a door key via Flickr.